Oh, Timehop. A great way to look back and see all the dumb things you said on Facebook before Messenger was a thing and before you could comment on people’s statuses and wall posts. But it’s also an app that can really show you just how much (or, I guess, how little) you’re doing with your life. I’m not going to bore you with a long, drawn out version of my life story, but I feel like I need to give myself a little credit today. I deserve it. It’s been a crazy year. 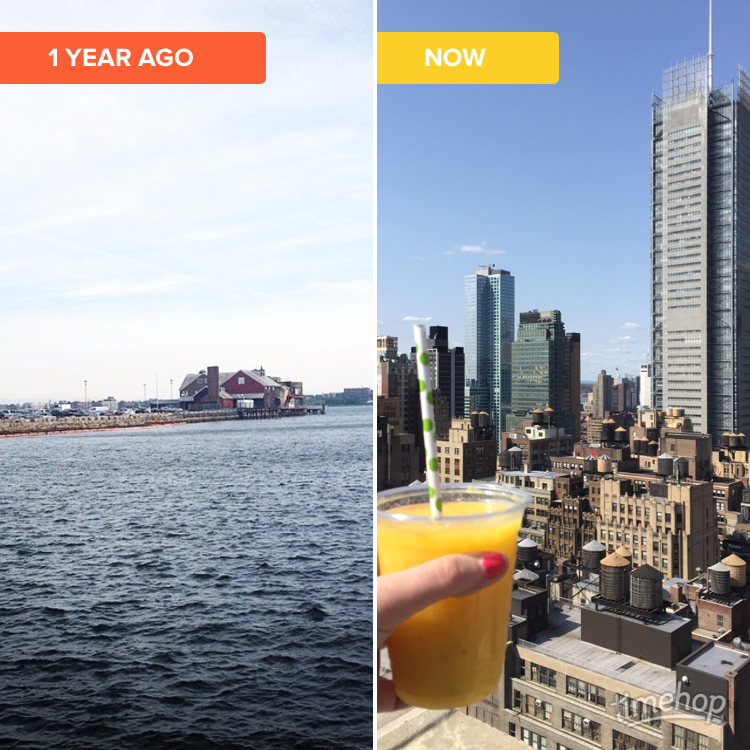 One year ago I was starting my first “big girl” job at Entertainment Cruises Boston and now one short (read: long) year later, I am at MediaCom NYC. The view is different, the job is different, the people are different. I don’t want to burn any bridges by saying which one is better, but I can say that I know a hell of a lot more now then I did then. If I weren’t laid off seven months ago from a job I thought I would hold for the rest of my life I would never ever be where I am today. I was completely content beginning my career as an event planner and basically not using my fancy degree at all. I wasn’t learning anything new and I certainly wasn’t in any sort of position to further my career in the future. I applied to about 500 jobs on LinkedIn. I got a few interviews but most were just duds. I then got two offers after a pretty extensive interview process. One was in Florida and one was in New York – one was far far away from anything I know and one was close to where I grew up. One paid a little more with a lower cost of living while the other paid a little less with a higher cost of living. Guess which one I chose. Obviously. From the Boston Harbor to Midtown Manhattan, I can safely say I’ve made some big changes this year. I guess the moral of my story is: Don’t let one setback become more than what it is. It’s a setback, yes, but it definitely does not have to determine your whole future. Keep putting yourself out there until you find your happy place – whether that be a NYC roof deck or a boat cruising the bay or a sandy, south Florida beach. → What do you call the things you put in your ears to listen to music?